Looks great in sunlight, of course. Such a shame that their railway network had to be in a city with no sunlight at night, and is instead lit by dingy yellow streetlights, under which white looks orange and orange looks orange. The Goblin people quizzed them on this a few months ago, but the LOROL suits were insistent, the colour scheme was perfect, the problem was Silverlink's substandard stations, and night time would simply have to be cancelled. Slightly less pretty, but actually readable in low light. It's almost as if they've got their priorities in the right order. One consequence of this U-turn is that if you're on a London Overground train at night and you can't for the life of you read the station signs, you must be at a station managed by London Underground. They replaced their platform signs early on, and are now stuck praying for the sun to orbit the earth. I see it still says 'Temporary sign'. 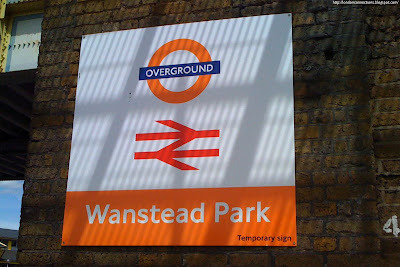 The TfL standard doesn't allow for black text, and in fact suggests that all platform signs showing the station name should be roundels with white text on a blue background. 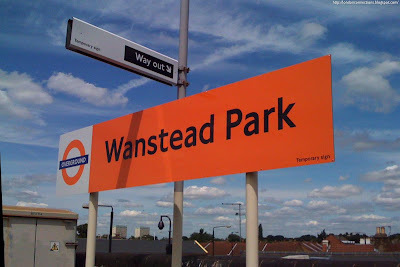 The only example like the one in your picture is for an external station fascia sign, with white text in an area quite likely to be lit with orange sodium lights. The erstwhile North Eastern Region of British Railways also used orange and white signs. They too encountered the same problem and overcame it by...providing a black outline for the white letters! Interestingly, the NE Region was abolished a year after Rail for London's present MD, Ian Brown started his first job working for...British Rail! Reassuring to see corporate memory is as bad as ever.